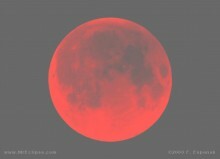 For some time there is talk on YouTubefilms about the next four total lunar eclipses , which look like blood red moons. They occur at dates of some Biblical Jewish High Holydays: Passover and Sukkot (Tabernacles).The last one, a total eclipse, occurred on July 22 of this year 2018. Also in 2015 there has been a total and a partial solar eclipse. This will occur on the Jewish religious New Year 1 Nisan and the New Year Tishri 1, that is the beginning of the months. Moreover, the Jewish year 5775 ( beginning September 24, 2014/1 Tishri) is also a Sabbath year! There are believers who think that this might indicate the (second) coming of the Messiah Yeshua. Each Biblical month begins with the new moon. So on the 15th of each month it’s a full moon. And so Passover and Sukkot always start with a full moon. This is ordained by God in his calendar (Leviticus 23). In the fourth century, A.D. the Rabbis abandoned the adoption of new moon by observation, because of Rabbi Hillel II who with Jewish mathematicians had devised a calculation method to determine the times of new moon. But because some holidays are not allowed to fall on a Friday, the date may not always be equal. The new or full moon sometimes just does not fall thereby in the 1st or 15th day, but viewed from the Bible the 15th of the month is always a full moon. Without interim partial lunar eclipses , are called in astronomy a Tetrad . On closer examination the NASA website1 shows that Tetrads periodically occur , but usually not exactly on the Biblical High Holidays. In the 15th century there were four Tetrads , possible one occured during Passover or Sukkot ( 1493 or 1494 maybe) . In the 16th century, six Tetrads , but not during Biblical Jewish holidays. In the 17th , 18th , 19th century no Tetrads ! In the 20th century Tetrads five , including two on a Biblical holyday. (1949-1950 and 1967-1968) . In the 21st century , see above. ( 2014-2015 ) . In the 22nd century, no Tetrads . Incidentally, around the time of Yeshua’s first coming , there was no Tetrad (100 B.C. and 100 A.D.) In the period of the exodus from Egypt , there were no Tetrads. Surrounding the future Jewish year 6000 (2239 A.D.) there are also no Tetrads mentioned. During every age a total of sixty solar eclipses are observable. God made ​​the moon for appointed times. Prophet Joel writes “The sun shall be turned into darkness and the moon into blood, before the great and dreadful day of the Lord come” (Joel 2:31). There will be signs in sun and moon and stars, and upon the earth distress of nations . Signs And then shall they see the Son of man coming in a cloud.” ( Luke 21:25-28 ). Yeshua says, “Immediately after the tribulation of those days shall the sun be darkened, and the moon shall not give her light,” this phenomenon only occurs on the first day of a Biblical month! “and the stars shall fall from heaven, and then the sign of the Son of Man will appear in heaven” (Matthew 24:29 ) . At His first coming the Messiah fulfilled the spring feasts . Are at His second coming the autumn Festivals in the center? Beginning on 1 Tishri? It is horrifying and exciting, but we do not know if Yeshua comes back next year. The Bible indeed speaks of solar and lunar eclipses before He comes , but not four times in succession. Also is it true that we do not know the time of His coming. However, we must pay attention to the signs. Also is there the sign of the mark of the beast on hand or forehead , without we are not able to buy or to sell. (Revelation 13:16). This still has to take place I think. And the abomination of desolation , which should come first (Matthew 24). Is ‘ the bride ‘ being taken up before the great tribulation , or at least during, or after? There are several possible interpretations of the prophecies and much still is unclear. For now we see in a mirror dimly , but then face to face. Now I know in part, but then I shall know fully. I would think it fantastic as soon as He comes back with all the saints and stands on the Mount of Olives to establish His Kingdom from Jerusalem. But He also comes to judge every man according to his deeds! My purpose is to live according to God’s Torah and to his honor, with love, care and respect for my neighbor. Let me be sober, be vigilant and continue to persevere. My light should remain burning with enough spiritual oil. Then I can confidently look forward to the future, a future with Him, and all of Israel with Him.